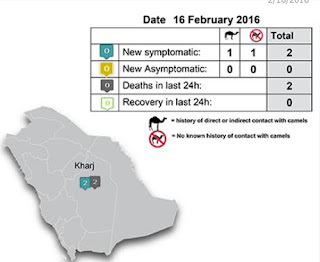 Although the Saudi MOH has reported relatively few MERS cases over the past few months, today we are informed of the 2nd and 3rd fatal cases in the past week. Both are elderly males (75 & 80) from Al-Kharj. One is described as having camel contact, while the other is under investigation. 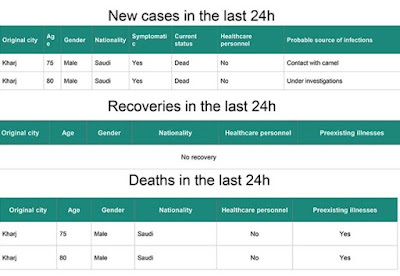 We've recently seen two other cases reported from Al-Kharj - a 47 y.o. male with camel contact reported on January 27th and a 41 y.o. male listed as a Household Contact - Indirect Contact with Camel on February 12th. So far the MOH has provided no information as to whether or how these cases may be related. We'll have to wait for the WHO report to get an idea whether the posthumous reporting of these cases indicates delayed discovery or simply a delay in the MOH's disclosure.